15,000 feet high. I wasn't feeling well. Neither was Sean and he promptly threw up. We were in the Andes, in Venezuela, and for us—having spent all our life at sea level—ramping up to this altitude in just a few short hours apparently didn't set very well with two of us. Michel and Brendan didn't seem to be suffering as much from the effects. We had just disembarked from what was touted as the world's highest and largest cable car in world, ready to set out on a daylong hike. Having taken the cable car below in the city of Merida—which itself sits at over 5,000 feet high—we descended at the end of the line, the top of Pico Espejo. From here we were going to hike for the day to the locally popular and rustic hamlet of Los Nevados for a weekend stay. It was pretty obvious that Sean and I weren't going to get far, so we decided to head back down to Merida for the night, hoping that with 24 hours more time at the lower elevation to acclimate to the altitude, we might be successful trying again the next morning. Indeed, our ascent the next day came off without a hitch, and we headed for Los Nevados from the end of the cable car line along narrow twisted dirt paths for a good six-hour trek. Local information had it that upon descending from the cable car at the top of the mountain, there might be some mules available for hire. Well, that wasn't the case so we set out on foot. We were initially told it would take four-to-five hours, but it took us a little over six, and not in the habit of hiking long distances with full backpacks for a weekend outing, we were exhausted once we arrived. At the time I remember it being rather "arduous" on narrow rocky paths, climbing, descending, switchbacks...and an especially long descent at the end. However, since that time, hiking has today become one of my favorite weekend pastimes, so it may not have been actually as difficult as I remember. Nevertheless, Michel and I were incredulous upon our arrival in the village that Sean and Brendan were no worse for the wear: trotting and scampering about with energy to spare as if they had been sitting all day! Michel and I were dead. Not sure what to expect upon our arrival, Los Nevados turned out to be a true discovery—a "find." As we rounded the last bend on the path, a picturesque and breathtaking canvas opened up before us as adobe whitewashed dwellings and a church steeple were peacefully nestled on a velvety green hilly plateau. Wispy feathery clouds dipped in and out, while the surrounding steep hillsides were dotted with farmers cultivating their fields with nothing less than oxen and antique v-blade hand plows: scenes straight out of history books. We later learned that because the hillsides were so steep, and this being the only land they could farm, tractors wouldn't work since they couldn't stay upright on such steep inclines. Being so isolated, yet in such a picturesque setting and not too far for intrepid hikers, the village profited from the location as best it could with locals renting out rooms as primitive "B&B's" or "pensions" to weekend visitors. Thus we easily found a hut for a weekend lodging, and a hut indeed it was: a very simple and clean one-room plastered and whitewashed adobe dwelling, with no electricity and no running water. It was perfect for the four of us. Our only source of light in the evening came from a few candles placed overhead on the low rough-hewn beams, and we washed up and brushed our teeth from the icy cold creek that flowed just outside the door. 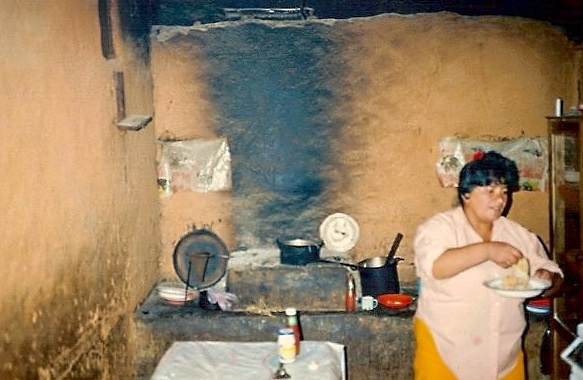 In addition to the lodging, the host also provided us meals in her simple rustic kitchen, prepared with just a few basic pots and pans over a wood-fired grill. We ate breakfast by candlelight in the windowless room. We spent our few days there just walking around the village and surrounding farmlands. The main street was one long uneven gravel dirt path, gently sloping downhill and bordered by the village one-room school; a "general store" of sorts; a saloon, and several humble residences. Villagers went about their chores and errands either on foot or on mule. Walking along the meandering paths around the village, we met a local farmer who was willing to hire out his two mules for our return trip to the cable car. We struck up a conversation and the next day he led the four of us on a local "scenic tour" of the area. Between Michel's and my very rudimentary Spanish, we got a basic understanding of life in the area, along with some spectacular views. We were intrigued by the occasional yodeling-type yelps we would hear bouncing across the valleys. Our guide would also throw out certain cries from time-to-time. He explained that it was their kind of "Morse code" to communicate with each other. Since many of the village farmers were spread out during the day tending to their fields, animals, and whatnot, this was how they talked to each other across the valleys. A yell punctuated or accented in a certain manner would mean something in particular: "I'm out here," "I'm on my way back," "Meet me there..." It was a complete dialect, and intriguing. We met up with our same "guide" a day or so later, and loaded some of our gear and the boys on the mules for the trek back. It was a daylong trip the villagers were in the habit of making as they would pick up goods sent up to them from Merida by way of the cable car. Although the mountains, and especially such legendary ones as the Andes, are indeed such a geographical opposite to the sea, they nevertheless foster a kinship in that we led somewhat of a similar lifestyle as that of the isolated people we encountered in Los Nevados. Like us, they could only depend upon themselves for most of their daily routines and make do with what they had on hand and without many modern conveniences. Ironically, we realized that with our "primitive" lifestyle on the boat, we probably even had more modern conveniences than these mountain folk! Once back down the mountain in Merida, we were back on the road to the coastal town of Coro, Venezuela, to be followed by just a short 20 minute flight back to Curaçao, where Cowabunga was safely berthed. Then it was back to our routine of laundry, repairs, school, and preparing for the next voyage. In the meantime we would savor the breath of fresh air and cherish our keen memories from our "seafaring" in the Andes.